In our daily lives we don’t often get the time to take a step back and even less often do we take the time to ponder what is our why? Recently, key leaders from across the globe gathered in the non-stop city of chaos, Las Vegas to do just that at the Micro Focus 2018 Global Leadership Summit. It was on the last day of the summit following a compelling presentation from Peter Docker on knowing your Why that I took a step back and asked myself the question, what is my why when it comes to my role and my company. After lots of thoughts and tangents it came down to one thing above all. It came down to Pride and the emotions that Pride evokes. Having a clear mission is critical. I am a firm believer that you have to provide people context and set expectations. I am proud in the clarity of the mission that Micro Focus has, not just because as an employee it gives me direction, but it allows me to set expectations with my team, customers and partners about who Micro Focus is and why partnering with us as a new member of the team, or as a customer or partner is something that they can rely on. Our Mission is simple – we help our customers to run and transform their business and innovate faster with lower risk as they race towards digital transformation. Now, a mission is great, but still you need to see the mission in reality. What if I told you that Micro Focus technology underpins some of the world’s largest mission critical apps? Well it does. An example that stood out for me was Cerner. Cerner use some of the Micro Focus products and in particular Vertica as part of their IT stack. Vertica is at the core of one of their platforms that is used to help with the early detection and reduction in the progression of sepsis cases. The Cerner platform powered by Micro Focus Vertica not only alerts doctors to specific patients’ status and the urgency of their condition, but it also includes suggestions on the next steps for treatment. When the mortality rate for those that enter into septic shock is around 50%, early detection is crucial. Hearing that story, knowing that the software that Micro Focus creates has the potential to help save lives, made me so incredibly proud. Sometimes it’s easy to get caught up in the day to day. 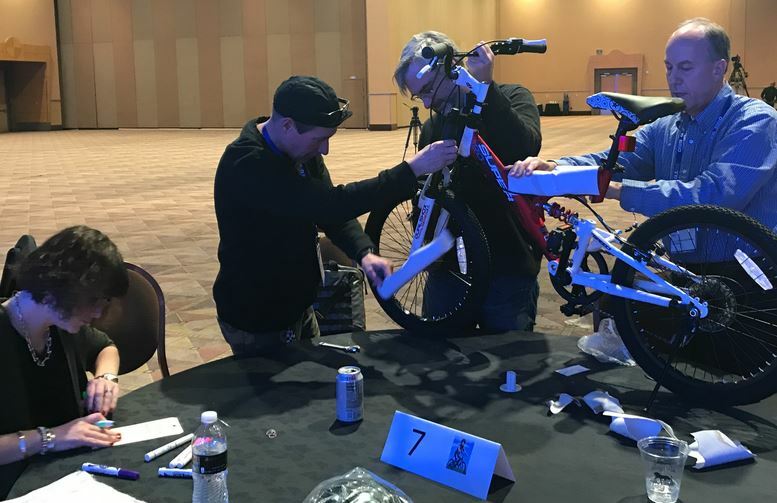 One of the great activities that we did as part of the Global Leadership Summit was an event at the end of the week where a subset of the leaders gathered together to build bikes for local charities and education programs. We partnered with Impact4Good to build 16+ bikes that ultimately would be given to children in local schools who otherwise may not have been able to afford a bike of their own. Knowing that amid everything else, the leaders that I work with and for were happy to take time out of their day and voluntarily help others gave me pride, as I believe it’s a reflection of how we can work together as a team in our professional lives. It proved to me that the leaders of our company, who didn’t think twice about supporting this charitable activity are strong, capable and driven by a common goal. At the end of the day, for me, a lot comes down to “The Who” (not the band although they are totally awesome) at work. I am incredibly proud of the who, the people of Micro Focus. So, to bring it all back to the beginning, sometimes its good to take a step back and take a moment to ask why, because when you do you will go back into this crazy world refreshed and revived, and most likely with a smile on your face and a renewed sense of pride, and who doesn’t want more smiles in the world?! Find me on Twitter if you’d like to ask me more about Micro Focus Technology or working here, and take a look through our fantastic Facebook album of the bike-building shenanigans……..
……………………what happens in Vegas doesn’t always stay there.